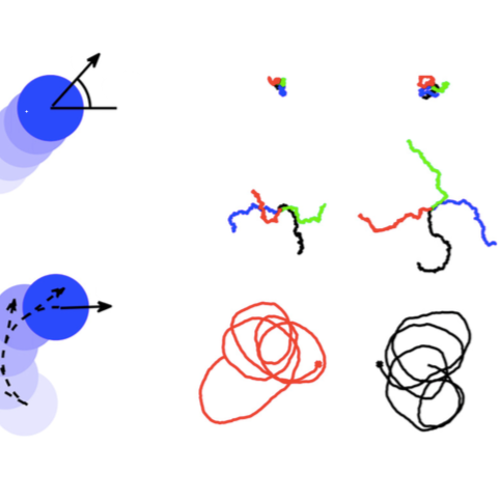 Simulation of Active Brownian Motion published in Am. J. Phys. Unlike passive Brownian particles, active Brownian particles, also known as microswimmers, propel themselves with directed motion and thus drive themselves out of equilibrium. Understanding their motion can provide insight into out-of-equilibrium phenomena associated with biological examples such as bacteria, as well as with artificial microswimmers. We discuss how to mathematically model their motion using a set of stochastic differential equations and how to numerically simulate it using the corresponding set of finite difference equations both in homogenous and complex environments. In particular, we show how active Brownian particles do not follow the Maxwell-Boltzmann distribution—a clear signature of their out-of-equilibrium nature—and how, unlike passive Brownian particles, microswimmers can be funneled, trapped, and sorted. Previous Previous post: Brownian Motion in a Speckle Light Field published in Sci. Rep.
Next Next post: Reply to Comment on Circular Microswimmers published in Phys. Rev. Lett.